The best sports betting sites. We review legal online sportsbooks and apps. With a slew of casinos offering sports betting platforms, we find the best on criteria such as ease of use, bonus codes, best odds, playing options, and payouts. Our expert reviewers have spent countless hours using these legal sports gambling options to recommend the best sports betting sites to keep you in the green. Why use legal sports betting sites? DraftKings is unquestionably one of the best sports betting sites. They have a clean, modern interface with a clear understanding of what bettors want. It is easily one of the best sports betting sites. BetStars NJ is one of our favorite sites, offering unique parlays and incredible promos. FanDuel Group is the combined company of FanDuel and Betfair, bringing one of the most powerful, comprehensive and modern sports betting apps to market. Now backed by the power of a large European gambling company, they will be one of the top sports betting sites. SugarHouse Sportsbook is part of the Play SugarHouse app (iOS, Android). It offers a wide array of options and a strong bonus to start. 888sport is a European based sportsbook that has recently entered the market. They have a wide variety of offerings and a reliable app. William Hill is a leader in the sports betting space. Their app is solid and full-functioning, but it lacks some of the modern features of its competitors. PointsBet is an Australian company bringing a unique sports betting app to the market. They allow you to be on over-unders with the opportunity to earn significantly more than the wagered amount. It’s a high stakes way to bet on traditional lines, all packed in modern, clean experience. 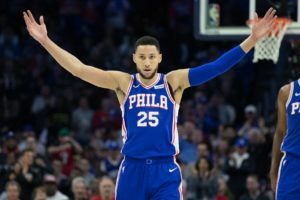 PlayMGM struck a partnership with the NBA for the use of official league logos and data, the latter being more important to offer unique prop bets. Before choosing a sports betting site, you’ll want to make sure online sports betting is available in your state. A Supreme Court decision has paved the way for states to legalize sports betting, but so far only a handful have done so and an even a smaller number offer online sports betting sites. New Jersey is responsible for getting the law that banned sports betting overturned, and they were one of the first to legalize sports betting after the decision. Currently, you can bet on sports in-person and online in New Jersey. For a more detailed look at sports betting in New Jersey, you can check out our New Jersey sports betting page. Delaware actually became the first state to legalize sports betting after the Supreme Court decision, but they only offer casino-based betting for now. There are no online sports betting sites in Delaware. For a more detailed look at sports betting in Delaware, you can check out our Delaware sports betting page. Not much explanation is needed here– sports betting has been legal in Nevada. Pennsylvania has passed a bill to allow in-person and online sports betting. So far, nine casinos have applied for a license. Online sports betting sites are coming to PA, but it might be a few months until they do. West Virginia has also passed a sports betting law and will bring legal sports betting to the state sometime in 2018. They will allow both in-person and online betting. Mississippi will legalize sports betting, but not online. Rhode Island will legalize sports betting, but only at two casinos. They will not offer betting online. It’s no secret that online sports betting has existed in the US for some time, essentially since broadband became available. But until now, all of these sites (unless you’re in Nevada) have been illegal. You will find other sites that review these sportsbooks and call them “legal,” but that’s referring to these sportsbooks being permitted wherever they’re based, not in the United States. It’s intentionally misleading. Data. It’s easy to decide a single-game bet winner based on the official score and stats, and you can have confidence that these sites will accurately declare winners based on actual scores. But the prevalence of real-time betting, particularly mobile sports betting, means that there’s a need for reliable in-game data which often isn’t available in a box score. The location of a shot, speed of a pitch, or yardage gained on a punt are occasionally subjective numbers where different outlets may have different numbers. If an offshore sportsbook has one-sided action on a specific play and the outcome is up for interpretation, there’s nothing to stop them from choosing the more amenable figure, and you would have no recourse to debate it. Live betting, however, will have to use verifiable data, and in many cases they will partner directly with the leagues to get access to all sorts of unique data, which means the outcome of your bet will be fair. Having this data has the added benefit of enabling a host of unique betting options that the offshore sites won’t be able to offer. Law enforcement action. Sports betting is big business. Casinos and state governments, who receive tax revenue from online sports betting, have it in their interest to eliminate unsanctioned websites. While some level of unregulated site will continue to exist, it’s within the realm of possibility that law enforcement will begin cracking down on offshore sports betting sites. Business partners and affiliates are already being asked to choose between the legal sports betting market and the offshore market. Sites that are doing big business where sports betting is now legal may be the target of raids or be forced to shutdown. Remember what happened with online poker. If this happens and you leave your winnings, or just large deposits with these sites, whether it’s $100, $1,000 or $100,000, there’s a real chance you won’t see your money again. That’s why it’s not worth using offshore sites where legal sports betting exists. Sports bettors who wager regularly must firmly understand the concepts of juice, also known as “vig,” and moneyline value in order to maximize profits, reduce losses, and, ultimately, establish long-term success. Juice represents a service fee that a bettor must risk in addition to their wager when they place a bet. There are two different important aspects of these concepts that one has to understand. First, let’s talk about point-spread wagers. Point-spread football and basketball wagers typically require a standard 10% fee with most sports betting sites, which appears as “-110” next to the given spread. This means that in order to win $100, a bettor must wager $110. Simple enough. This service fee is only actually paid on losing bets. It’s also important to note that some sportsbooks will skew the point spreads if they see a disproportionate amount of money on one side of a proposition, and some sports betting sites will also manipulate the amount of juice charged on a points spread bet. Offshore books charge as much as -135 on point-spread football wagers, which is something bettors should run far away from. A moneyline bet eliminates the point spread element dynamic and simply requires that the selected team wins. While it seems relatively easy, there is a catch—if a bettor wagers on the favorite, they will have to risk more money to do it. That makes sense. If a great team plays a bad team, and it cost the same to wager on either side, bettors would overwhelmingly take the better team. That would present a losing proposition for the house. Therefore, sports betting sites charge a varying fee on favorites and offer an additional payout on underdogs to entice bettors to that side. Seems like a relatively simple concept, yes? Here’s where things get a bit more complicated, but this is important stuff. A 10-cent line is considered the most fair and ideal moneyline odds offered by sportsbooks, but it’s also more difficult to find. It is a line where the difference in two possible outcomes is only 10 cents. For instance, if, let’s say the Diamondbacks are listed as a -140 favorite over the Phillies in a given contest, and the Phillies are a +130 underdog, the difference between those two lines is 10. This represents what is thought to be fair value on both sides of the bet because the risk of betting on the favorite is proportionate to incentive of betting on the underdog. It’s important to know, however, that some sportsbook will regularly juice up lines and create a much more significant disparity between the favorite and underdog. Some sports betting sites will regularly offer 20, and in some cases 30-cent lines (stay away! ), which presents far less value to a bettor. There is significantly more risk in wagering on a favorite and significantly less incentive to bet on the underdog. This is not only bad in terms of value in a single bet, it’s a killer over the long-run. A bettor takes five favorites, all listed at -120 to win. He goes 3-2 in those games. He earns $300 on his three wins, and loses $240 on his two losses, so he profits $60 dollars on those five bets. He then takes five underdogs listed at +110 and goes 2-3 in those games. He earns $220 on his two wins and loses $300 on his three losses, which is a net loss of $80. That means his loss was $20 on those 10 bets. Now, let’s say a bettor does the exact same thing, but gets 20-cent lines instead. Now, the favorites are listed at -125. He still goes 3-2, but now he only profits $50. He takes the same five underdogs, but this time at +105, and again goes 2-3. He now has a net loss of $90 on those games. His combined total loss on those 10 games is now $40. Now, do that over an entire week, month, season, year, whatever. That line disparity has a SIGNIFICANT impact on your bankroll. Just something to think about. Be careful out there, and when you can, always shop for the best lines available. The best sports betting sites will offer fair lines and won’t intentionally mislead new bettors. Most top sports betting sites offer some sort of signup bonus, either with a code or automatically. We generally don’t think these are a big deal as they are similar between most of the sites and come with some fine print to prevent you from quickly withdrawing you bonus or the winnings from it. However, occasionally there are strong offers that can compel you to choose one site over another. We don’t think you should ignore these offers, but you should consider other factors before choosing one of these sites. We judge these top sports betting sites on a number of criteria. This is arguably the most important factor for legal sports betting sites. You want a site that cleanly displays lines, spreads, odds and in-play bets. A bad interface is not only frustrating and confusing to use– it zaps the fun out of playing. In-play betting, specifically, is the most exciting aspect of mobile sports betting, and apps designed with a clean interface that allow you to quickly identify your target bet, place your wager, and see your winning bet, are the most fun to play. Before we get to odds, it matter what bets are being offered. Great odds on bad or boring props is no fun. We of course look for sites that offer betting on the most sports, including the NFL, NBA, MLB, golf, tennis, racing and, increasingly important, esports. Within each sport, we look for sportsbooks that offer unique props that are updated consistently during the widest range of games and matches. In most cases, legal sports betting sites will have slightly higher vigs for reasons already discussed. These online sportsbooks have more overhead and pay taxes, so that cost is inevitably passed on the player. But, some online sports betting sites offer much better odds than others and the difference can be huge for coming out on the winning side or losing side of your sports bets. We absolutely look at other reviews and comments. Sports betting site reviews on iOS and Android contain a slew of user complaints and observations. We factor in these observations – good and bad – when putting together the top sports betting sites. Let’s face it, you want to play what your friends are playing. There’s a significant network effect with sports betting sites, and with the possibility of challenging friends heads-up, you’ll want a site a lot of people are using. And these apps tend to be well-funded and offer varied and unique opportunities to play. Full transparency: We are affiliates of the sites listed on this page. That means we receive a commission for referring you to them. However, since we are affiliates of all the sites, all that matters to us is that you choose the best site for you. Our aim is to provide a service to potential sports bettors. If our reviews or sports betting guides are helpful to you, then perhaps you’ll recommend us to a friend, sign up for our email list, or just read our site, such as our sports betting tips page. Rather than shamelessly plug only our partner sites, we give each of them a fair review, noting strengths and areas for improvement. We are much better served if readers get something out of our reviews and find out sports betting guide useful. We also do our best to keep this page and our reviews of sports betting sites updated for when apps have updates and new players enter the market. We have been around for over 8 years and have a staff of professional writers who not only review, but also play, with their money, on each of these sites. We quite literally put our money where our mouth is. Unlike the old days of sports gambling, we feel the best path forward to a fun and sustainable world of sports betting is through transparency and quality, accurate content, without the scaminess of “locks” and a wall of bonus codes for sketchy or otherwise poor sites. Point spread bets are widely-considered to be the most standard football wager. A point spread is a number assigned by bookmakers that designed to make each side an equally attractive betting option. This is necessary because teams are rarely viewed as equals, so most bettors will pick the team they perceive as better to win. Therefore, a point spread establishes how many points the favorite (the team considered more likely to win) must win by over the underdog (the team considered more likely to lose) in order to win the wager. This number will fluctuate depending upon the perceived disparity between the two teams. “Who is going to win?” This probably is the most fundamental question one asks when considering or watching any sporting event. Moneyline bets allow you to wager on this very question. The score doesn’t matter, nor does the margin of victory, thus eliminating the point spread from the proposition. If you select the winner, you win the bet. Let’s say you have no idea which side will win a game or cover, but you have a feeling points will be at a premium. You can bet on what is referred to as the “total,” or “over/under.” Bookmakers will assign a number of points they believe the two teams will combine to score. Other types of bets include teasers, parlays and live betting, which is a huge growth area for online sports betting. Read more on NFL betting. Full disclosure: We are an affiliate of legal sports betting sites, so we may receive a commission if you use our links.